Despite the changing technological advancements, SPEED remains to be the holy grail of the consumer packaged goods (CPG) industry. Today, the speed at which organizations take advantage of the latest consumer trends and shield their market share against the competition defines the business’ success rate. This year, as new waves of millennial shoppers navigate the marketplace, companies are beginning to take notice of an emerging trend in CPG: eCommerce. With consumers harnessing the power of the Internet to make more informed decisions, websites, social media, and mobile apps are increasingly used for product research, price comparison, or product purchases. In addition, CPG is one of the early innovators of Big Data and analytics tools, which has transformed into a key tool to win the battle for retail shelf space and customer sales. Amidst these technological innovations, to help CIOs find the right CPG technology solution providers for their enterprises, a distinguished panel comprising of CEOs, CIOs, CMOs, VCs, analysts and the CIO Review editorial board has reviewed hundreds of solution providers engaged in fulfilling the demanding needs of the current CPG industry. The final assessment is based on the organization’s ability to develop innovative technologies, methodologies, and outstanding customer service, while helping CIOs realign their IT strategy directly with that of the business. 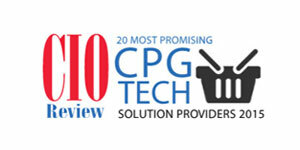 We present to you CIO Review’s 20 Most Promising CPG Technology Solution Providers. 1 EDI Source Provider of Electronic Data Interchange (EDI) software and outsourcing solutions. 1010data Provides a unique, cloud-based platform for Big Data discovery and data sharing. 1WorldSync Provides global product data management and data pool solutions. Advanced Distribution Solutions, Inc - ADSI Advanced Distribution Solutions, Inc. develops and integrates order fulfillment and multi-carrier shipping software solutions for manufacturers, distributors, e-commerce, 3PLs and others. Arvato Systems A global next generation IT systems integrator focusing on digital transformation solutions. Babelway Provides a web-based platform that automates B2B data and document exchange for businesses, integration service providers and application vendors. CenturyLink Provides broadband, voice, wireless and managed services to consumers and businesses across the country. Enterra Solutions Provider of Big Data semantic and computational analytics. Highjump Software Provider of supply chain management software and trading partner network technology. InContext Solutions Provides a web-powered 3-D shopping platform that revolutionizes how real-world simulations can deliver unique insights to drive more effective decisions. Interactive Edge Provides a set of agile business intelligence tools that apply best practice analytics in Microsoft Excel and PowerPoint–driving speed to insights. Logility Provider of collaborative supply chain planning solutions that help companies realize substantial bottom-line results in record time. LumiData Provides fast, immediately actionable insights into retail demand information to enhance marketing strategies and drive growth. Manthan Provider of a portfolio of analytics-enabled business applications, advanced analytics platforms and solutions. Nielsen Nielsen’s services address the entire ecosystem to drive profitable growth–Big Data, advanced analytics, integrated applications and interoperability with client systems. Planorama Provides image recognition technology for the retail environment. Quri Quri is a retail intelligence and analytics company. Quri gives consumer brands and retailers the visibility to see what their shoppers are seeing and the analytics to immediately correct the problems they find. Retail Solutions Delivers a comprehensive suite of SaaS solutions that convert Big Data requirements into actionable visibility at the shelf level. Softeon A leading global provider of technology solutions in the Supply Chain domain. WSI Delivers tailored, end-to-end supply chain solutions designed to maximize operational efficiency, ensure reliable performance and minimize shipping costs.